We usually associate Maddalena Marconi with ostentatious evening bags covered in fringe and crystals. But the fashion house shows it can take its aesthetic down a few notches with this suede hobo. This is a classic hobo, which slouches in all the right places. The soft suede it's the perfect material for a bag with such a relaxed finish. It creates that typical hobo silhouette without appearing slovenly. The rich purple shade helps make it feel especially regal. But you can't take the flash out of Maddalena Marconi altogether. Stones and crystals are threaded along the handle for an added dose of opulence. Personally I'm not sure this hobo needs them, but I suppose fans of Maddalena Marconi's usual aesthetic will be happy for their inclusion. This hobo is sizable, and if you want to push its soft suede walls to the limit it can feel even bigger. There's no risk of running out of space, although it could become a black hole if you don't clear it out regularly. There's a trio of interior pockets, but I still expect clutter to collect in its spacious main compartment. Maddalena Marconi again employs luxury materials, but they're far less opulent than the ones it typically uses. That sees this hobo priced at a relatively affordable $495. If you've always wanted to own a piece of Maddalena Marconi bought thought you couldn't afford it, this might be your bag! 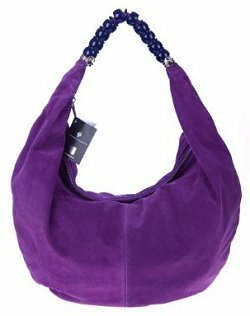 The gray Maddalena Marconi suede hobo bag, a great alternative to this purple bag.